A little tricky to put together, but worth the effort. They will be perfect for our August outdoor wedding. Love them but need color combo options! 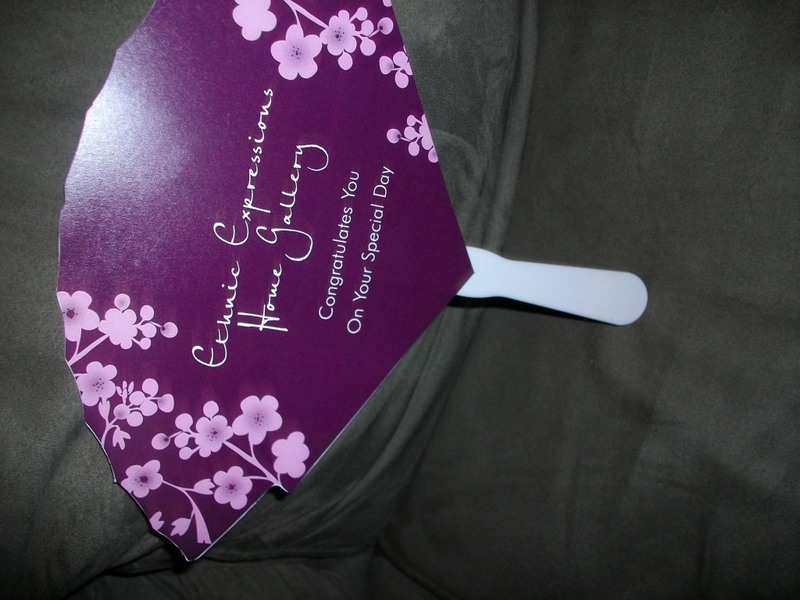 I loved these fans and the idea of the triple whammy of a program, keepsake and portable fan! They were really good about sending me the proofs despite changing my blossom color three times. 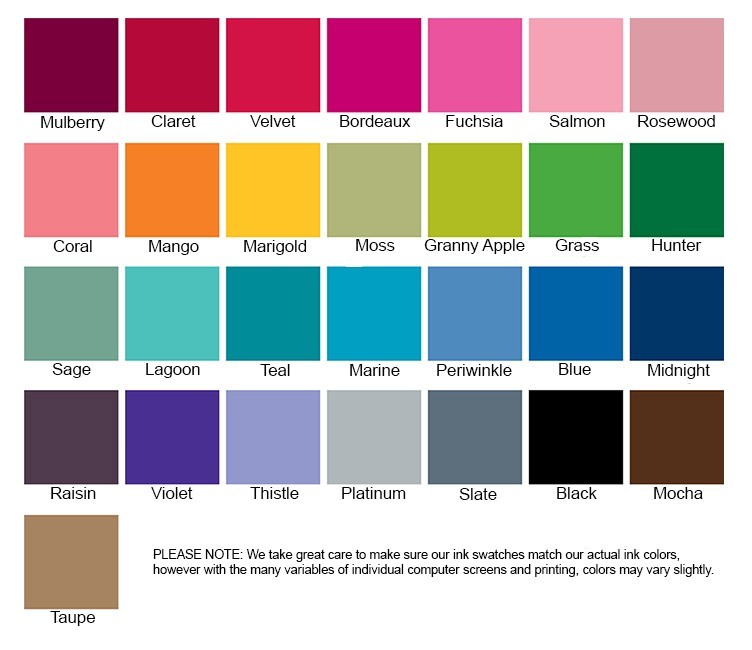 It would be very beneficial for Beau-coups customers if they created an option to view color combos with the background and blossom colors while placing order. It is very hard to determine what some of the colors will look like. I chose the chocolate brown as the backround color and kiwi color as the blossom color but changed the blossom color twice before picking kiwi and giving the OK to send to print. Otherwise the final result did turn out wonderful! The fans were very unique and beautiful! The color was exactly what we wanted! Everyone at the wedding loved them! Thank you so much! While we haven't actually used our program fans yet (wedding is in less than a week) I am absolutely thrilled with the quality of this product as well as the quick turn around in delivery!! We added a lace ribbon with a charm at the bottom of each fan and they look beautiful!! I can't wait to hear the comments from our guests!! Was this helpful?Yes|No 1 people found this helpful. They were a bit thinner card stock than expected, but overall were very cute, unique, and practical for an outdoor wedding. I was a little disappointed that these weren't a bit thicker cardstock, but otherwise am thrilled with the product and Beau Coup service. Ordered these 5/21/12 with expected arrival date 6/6-6/9, but received them 5/29/12! These fans have Cherry Blossoms on them. My son is getting married at a winery in June and he resides in the Washington, DC area so they give a cute tie in to where they live and will cool the guests at the ourdoor ceremony. Easy to add ribbon onto the bottom as streamers, takes about a minute per fan. Colors are true to site and the cost is good. I don't know why they included the double sided tape- it was unnessary since the stock was heavy enough and printed on both sides. I added my own ribbon and they look good. We will use them for daughter's garden wedding in hhumid, hot August. From ordering to proof [...] Done very fast and professional. The fans are difficult to put together. I was under the impression that the paper would be double-sided, however, the front and back are 2 separate papers. In order to assemble the fan, you have to cut the double-sided tape first for the handle and then in 4 pieces for the paper, then paste it on one side of the fan. It is not easy to get the papers to line up evenly, so it is very time consuming to get it done right. I like the finished product, but it has taken me about 5 minutes per fan to put together. 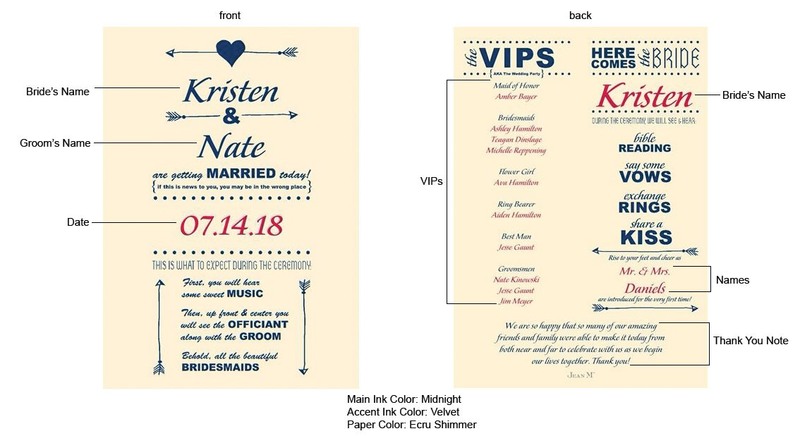 Even though the cost was a little high versus printing regular folded paper programs and there was 100 minimum I went for it with the hope these would add a personal touch to our August outdoor ranch wedding. I would have rated a 5 if they had come pre-assembled. Input of the info got a little frustrating due to max characters but I had a lot to say (a common prob for me). I couldn't have made a better choice, the text is perfect the Lagoon color is perfect. We were able to list our ceremony, participants and a full paragraph about the historical/family significance of our venue on the back. Because of the layout we chose, the flowers were not available and the plain fans are quite plain. But I was prepared, at the craft store I found various size monarch butterfly hole punches and flower punches and white glitter cardstock. I glued just half the butterfly to the fan and it gave it a 2D effect. I did use some good quality clear dry glue from the craft store to assemble the fans rather than the sticky tape (a much faster process when you have to assemble 100 fans, 300 butterflies and too many flowers to count. End result is so cute and I don't consider myself crafty. I've received nothing but compliments. 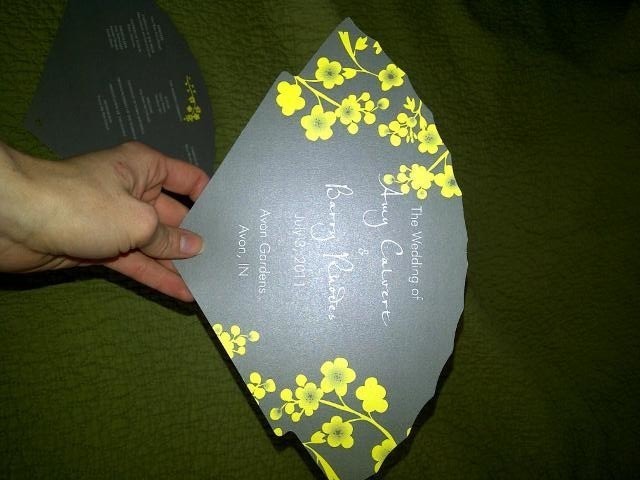 A photo is attached, they compliment our invites perfectly. TIPS: Print the color chart on a good quality printer if you are trying match other decor...lots of colors to chose from. Also, if you write the text in Word and try to cut/paste into the order form online some of the characters (apostrophe)change to a funky character so proof the text well. One last thing, the rep who sent the proof was very polite. She made 1 minor change (that was my error/oversight) flawlessly. Thanks Graciela! This product is worth price! My product came in ample enough time along with the proofs. They did excellent with making sure the spacing was neat and everything was on it I wanted it too. The preholes were wonderful and it was easy to put ribbon through them. Thanks alot! I ordered these programs for my July 16th wedding. At the time of my order on June 20th, I was told to expect the programs between the 4th and 11th of July. I was a little nervous because I knew that I would be really busy that week. They arrived on June 30th! They were slightly larger than I expected, but I love them!Thank you!!! These fans were great, except I was a little disappointed in the color. I chose sapphire online, but when I got them, they're more of a purple. Luckily, it still went with my colors, so it really wasn't a big deal, but I would advise anyone in the future to call and speak to someone to make sure the color you pick will be what you get. Otherwise these fans are perfect. I was able to completely personalize it and they're made of heavy enough paper that I know they'll be fine for my outdoor wedding. Great product, just be careful on your color selection. Love, love, love these fans ! ! Perfect for my daughters garden wedding. Able to match colors to the bridesmaids. More unique than other fan styles I had seen. Would have liked more options for the font style and layout and other icons rather than Cherry blossoms. I would have loved the cherry blossoms, but they didn't seem to go with the other flowers being used for the wedding. If there was a star fish option I would have liked to add that somewhere on the back. My wedding ceremony is an outside affair taking place in June. In case the quests get hot (I live in Miami, FL) they will have these beautiful fans to cool them off. The fans are perfect with quick turn around time. [...]. Found it a little tough to fill out writing portion. Fan w/o a handle- absolutley worth it! There is ZERO assembly required for fans without handles- they are printed front & back on 1-ply card stock with a little hole punched for small ribbon, heavy enough to fan yourself with. Don't expect miracles here, it IS still paper! No tape, no glue, no time- just a little ribbon if you want! The columns are auto-formatted exactly as pictured in the product images. They are centered & spaced evenly, even if you don't meet the maximum amount of lines. I have a very short ceremony program & small bridal party, so my concern was it wouldn't look spread out over the entire fan. It looks great! I DID mention keeping the columns centered in my "special directions" or comments to the creator. I also made a change based on my online proof & it was correctly altered prior to production. I'll include pictures of my hand vs. the fan for size reference, but it is perfectly proportionate to an adult or child. I plan on leaving them on the ceremony chairs for my guests at our outdoor garden wedding this July!! I had great aspirations to be a DIY Bride & save money by being crafty, but I also have an over-full-time job preventing me from doing so! Having these fans printed & shipped to my doorstep (rather than using my rare spare time shopping for, purchasing, printing, & assembling them myself) is absolutely priceless to me. The quality vs. cost is perfectly aligned. 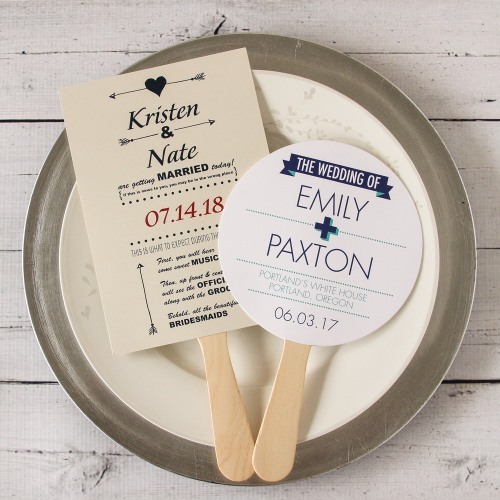 These things are a triple threat- fan, program, & takeaway wedding favor! Try pricing all three of those things individually & figuring price per guest, then compare it to your total here...you can't beat this!!! Despite some of the reviews of them being annoying to put together, I ordered them. I was 100% happy that I did!!! I got the ones without the handle and there was no assembly at all! I tied streaming ribbon through the prepunched hole and they look amazing! I thought the price was a bit high but in the end I am very happy with them! We got these to use as programs at our outdoor May wedding. We wanted a short and simple program and this was a great way to do it. Customer Service was more than helpful in getting the wording and everything exactly as we wanted it which is invaluable to me. It would be nice if it came with pre-cut ribbons to tie on, I bought and cut some but they are all fraying at the bottom. I also thought the price as a bit high especially since we had to pay for it in full before seeing the color and design in the proof. Other than that I think they're perfect. I used the program fans at my November outdoor wedding in Florida. The guests were stunned at the idea and bold color. I will recommend this for all outdoor weddings. The fans were the perfect size, and the color was consistant with what I saw online. We tied ribbons onto the fans, similar to the examples on the website. They were very pretty. My only complaint is that the paper was too thin. The fans were not sturdy enough, especially considering the humidity in Jamaica (location of destination wedding). Loved these fans...they are the cutest. Got these with the wooden handles...they are a major pain to assemble though. I suggest getting glue dots to do this rather than the strips that come with the kit. Perfect for an outdoor wedding! We had an outdoor wedding in about 100 degree heat so the fans were perfect as programs. the lipstick pink and salmon combination matched my bridesmaid dresses perfectly and the contrast against the mountain background was stunning. everyone complimented (and thanked!) me on how creative, functional and beautiful the fans were. the website and overall ordering process was intuitive and easy to use. the assembly was very tedious...the double sided tape was small and difficult to peel. the instructions said to use only 1 piece per fan (cut into 4 smaller pieces), but in the end we had a lot of double sided tape left over. if we used 2 or 3 pieces per fan, it would have made assembly easier and the fans a little sturdier. The quality was great[...]. Coloring was rich and font was perfect. The only drawback is that I had to assemble and I didn't order the glue that came with it. I purchased glue sticks but I ended up getting a hot glue gun because the glue sticks didn't work. I was slightly disappointed when I receive my fan programs. Mostly due to the fact that the "minor assembly" really means total assembly. The programs come in 4 pieces, front of the fan, back of the fan, the stick and 2 pieces of tape to put it all together. The whole reason I ordered these was because I had made the rest of the stationary for my wedding and was tired. For the price they charge I feel I should not have to put in 2 hours of assembly on my end. Slightly lesser quality than anticipated, but overall, it will be a nice touch to our ceremony in 2 weeks. I used these fans at my outdoor wedding and loved them! Good product. 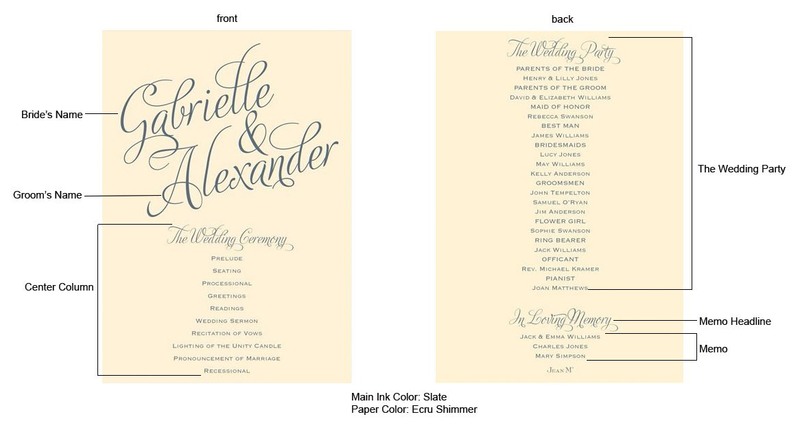 I ordered the wedding program fans, web sit was a bit confusing as to what the writing format would be. [...] My wedding is in two weeks and i'm sure they will be a hit. Everything was great. [...]. The wedding program fans were wonderful and a big hit at my daughter's wedding. I used the product as a promotiolnal tool for my business. I was a Vendor at a Multicultral Bridal Expo and I ordered the fans,(in my favorite color purple)because people get married in the Summer and they are hot and fans work well. On the front I had Congratulations on your Special Occassion from and I put my Business Name. Then on the back I put down how you can earn free art, all about the business and how you can join the team. Everyone that I handed them out to, thought it was a great idea and they wanted to know where I got it from so they can use it for their programs. It was a great Success, people have been calling me for business. Thank you. This product is very cute and looks great. I will use them for my outdoor beach wedding. I only wish there were more colors to choose from for the cherry blossom design. The fans were somewhat tedious to assemble, but not difficult to carry out. I was very happy with the way they turned out especially because I had a special formatting request that was carried out perfectly! Definitely happy with my program fans! I ordered the fans with wooden handles, and I'll be using them for my outdoor June wedding. I love that they're actually fan-shaped -- such a fun alternative to the square-paper-glued-to-a-wooden-stick thing. The color and layout options gave me a nice variety to choose from. I went with the cherry blossom pattern and I love it! I'm having to put the fans together myself since I ordered them with the wooden handles, but I think it'll be worth it, and they're still very classy looking. 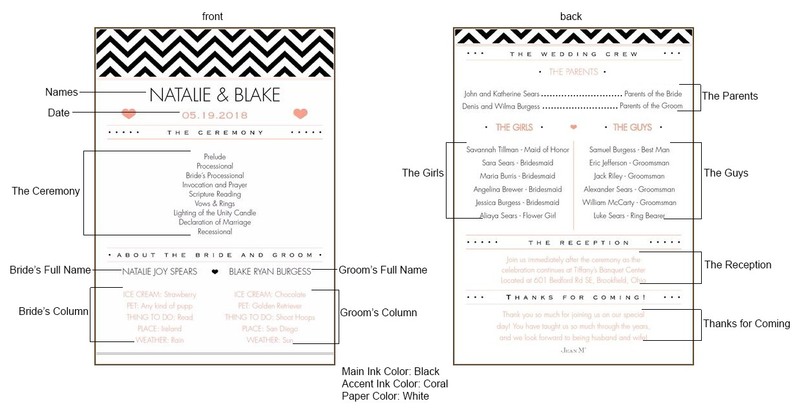 They'll give my wedding a personal, unique touch that's just so much more fun than traditional paper programs. They'll also be a fun favor for my guests and look great in a scrapbook. Not to mention my guests will probably thank me for giving them SOME sort of respite from the Tennessee summer heat! Q:Can you customize the back with a template I already have? A:Unfortunately these program fans only come with set design personalization options. Q:Can the text or order of the wording be changed on the fun and whimsy design? For example, can it just say "Reading" on the back and could the text below the names on the front be replaced with our own quote? A:The wording of the design is defaulted and cannot be changed. Q:I am choosing the fan without the blossom - on the back, do you only lay it out in a straight, veritcal line? or can I request to have the text evenly spaced across the back of it? I love the way the front would be laid out - but I think that the back seems to be boring - and a lot of empty space. Q:The text color of canary is black? A:Yes, the canary colored fans feature black text. Q:I really like this fans but I want the text color is black. The text color is only avarable white? A:The text color is determined by the color of the fan. A darker colored fan will have a lighter text, such as white, whereas a light colored fan will have a dark color, such as black. A:We no longer offer the red colored fan at this time. Q:What color is black and what color is red? A:The color black is ebony and we do not offer red at this time. Q:I have added accents over a few Spanish letters. When I went to add to the cart the wording accents were replaced with symbols. Will the accents letters show correctly? Thanks. A:Once your order is placed you can email info@beau-coup.com and send us the exact text you'd like with personalization. Please reference your order number in your email. Q:I havn't read anywhere about how durable the fans are. 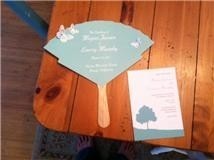 We are planning a mid summer wedding and these would be really nice if they are durable to use as actual hand fans - what type of paper are they printed on so they don't just flop if ppl are waving them to cool down. A:The fans are printed on card stock, so it would be like making a fan out of a birthday card. It would not be designed to really fan a lot of air. Q:What color are the plastic handles? A:The plastic handles are an opaque white. Q:Did I read it wrong or do the Wedding Program Fans really come in sets of 25 and you have to order a minimum of 4 sets? Does that mean the smallest amount of fans that can be ordered is 100. What about those of us who have small weddings with 50 guests or less. I think your fans are adorable and would like to order them but I only need 50 not 100. Is there any way for me to just order 2 sets? Thank you for taking the time to answer my questions. A:The program fans come in sets of 25 and you would need to purchase a minimum of 4 sets. We apologize for any inconvenience. Q:I need the program in red, which color should I pick in order to get the red program shown on the picture? A:In the main product image, the red colored fan is "Velvet". Q:Are all the blossoms pink? A:When you order, you will be able to select the fan color and the blossom color. Q:I want to order the fans with blossom designs but I want to use the solid design for my back since I don't have too many writings to include in the program. Is this an option? A:The fans are going to be made with the same paper on front and back. If you choose the blossom design, the back of the fan will also be in that design. Q:I am going to order the blossom fan without handle. I have questions on the text for the back side. Column 2 says 20 text lines, 30 characters per line. Does the 20 lines include blank lines between lines of actual words? I have 17 lines of actual words for Column 2. Will there be any room for spacing between this lines. Also, I entered the information with the lines of type listed underneath each other this but when I add it to my cart all the lines run in together. How will you know which words go on a line and when to go to the next line. For instance for the order of ceremony I had Gospel Reading on one line and Homily on the next line and Exchange of Vows and Rings on the next line but when you add it to your cart it shows "Gospel Reading Homily Exchange of Vows and Rings" No breaks for lines. A:The allowed characters per line account for spaces needed between text. Please note that characters include spaces, text or punctuation. As long as you stick to the restrictions for each line, we will set the fans up that way. You will receive a virtual proof within 5 business days after you place the order with us so that you can make any needed changes. Please email info@beau-coup.com if you have further questions regarding placing this order and we will be happy to assist you. Q:I love your wedding program fans w/o handles. My only concern is that I would need white blossoms with the oceanside colored fan. Is this possible? A:We can do an "Oceanside" background and a light-colored blossom, however; we do not have "white" blossoms available. Please see the color chart on the left side of the product page to view the color choices. Q:What is the set up fee about? A:The $138.00 fee on the program fans is a non-refundable set up fee. The set up fee is required to set up the text on the fan and also includes one free virtual proof for you to view the fan before printing. Proof will be sent within 2-3 business days after order has been sent to production. When it comes to sunny summer weddings, everyone is a fan of wedding fans. Help guests beat the heat with these wedding fan program favors. Each practical wedding favor doubles as a wedding program, so your destination wedding, outdoor bridal shower or spring wedding won't just be cool—it'll be eco-chic! With an assortment of designs, you will be sure to find the perfect one to fit the style of your wedding! Layout and text lines are as shown in the image for each design. All text will be processed exactly as submitted, please review carefully. Some assembly required and ribbon not included. Fan handles will arrive separately, with adhesive stripes for easy assembly. Fans will be printed in the font style shown. For more fan-tastic favors, take a look at our cherry blossom silk hand fans, colored paper hand fans and woven mini buri hand fans. Of course, the perfect companion favor is a personalized water bottle placed at each guest's seat.